On April 15, 2013, two explosions occurred near the finish line of the Boston Marathon, killing three people and injuring over 200. An unprecedented manhunt was launched to find the perpetrators, one of whom was killed and the other was taken into custody. Police officers with their guns drawn hear the second explosion down the street. The first explosion knocked down a runner at the finish line of the 117th Boston Marathon. 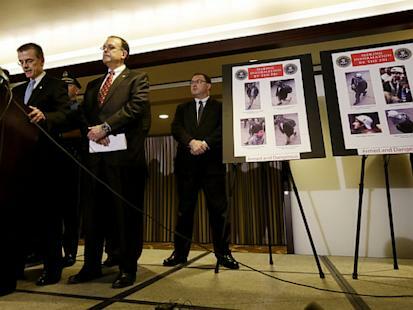 On April 15, 2013, two explosions occurred near the finish line of the <a href="http://abcnews.go.com/topics/news/boston-marathon-explosion.htm"target="external">Boston Marathon, </a>killing three people and injuring over 200. An unprecedented manhunt was launched to find the perpetrators, one of whom was killed and the other was taken into custody. </br></br>Police officers with their guns drawn hear the second explosion down the street. The first explosion knocked down a runner at the finish line of the 117th Boston Marathon. A Boston police officer clears Boylston Street following an explosion at the finish line of the 2013 Boston Marathon in Boston on April 15, 2013. People react as an explosion goes off near the finish line of the 2013 Boston Marathon in Boston on April 15, 2013. People react to an explosion at the 2013 Boston Marathon in Boston on April 15, 2013. Two explosions shattered the euphoria of the Boston Marathon finish line on Monday, sending authorities out on the course to carry off the injured while the stragglers were rerouted away from the smoking site of the blasts. Boston Marathon bombing victim James Costello staggers away in his torn clothing from the finish area in Boston, April 15, 2013. A man comforts a victim on the sidewalk at the scene near the finish line of the 117th Boston Marathon. Bystanders help an injured woman at the scene of the first explosion on Boylston Street near the finish line of the 117th Boston Marathon. An emergency responder and volunteers, including Carlos Arredondo in the cowboy hat, push Jeff Bauman in a wheel chair after he was injured in an explosion near the finish line of the Boston Marathon, April 15, 2013 in Boston. A woman kneels and prays at the scene of the first explosion on Boylston Street near the finish line of the 117th Boston Marathon on April 15, 2013. This was the scene on Federal Street in the Financial District at around 3:20 p.m. on April 19, 2013 during the ongoing manhunt for a suspect in the terrorist bombing of the 117th Boston Marathon on April 15, 2013. One of the blast sites on Boylston Street near the finish line of the 2013 Boston Marathon is investigated by two people in protective suits in the wake of two blasts in Boston on April 15, 2013. 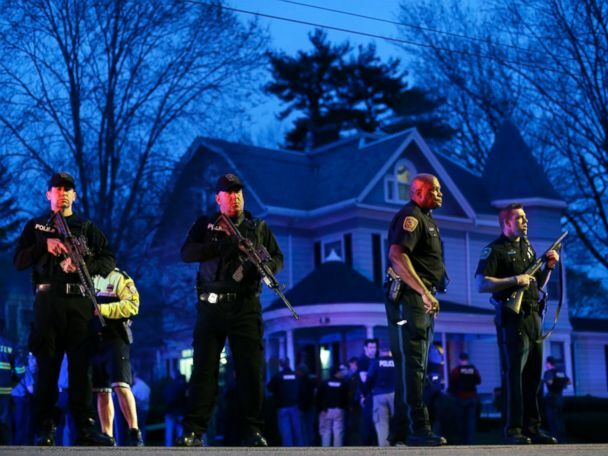 SWAT teams moved into position in Watertown in Boston, April 19, 2013, while searching for one of the two marathon bombing suspects. A woman carries a girl from their home as a SWAT team searching for a suspect in the Boston Marathon bombings enters the building in Watertown, Mass., April 19, 2013. 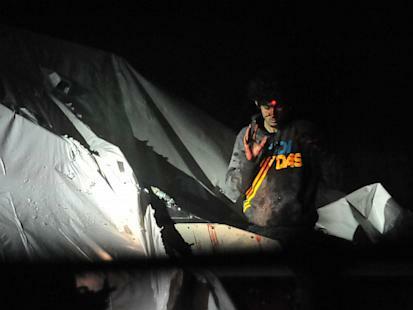 A sniper trains his bead on Dzhokhar Tsarnaev on April 19, 2014 him in Watertown, Mass. 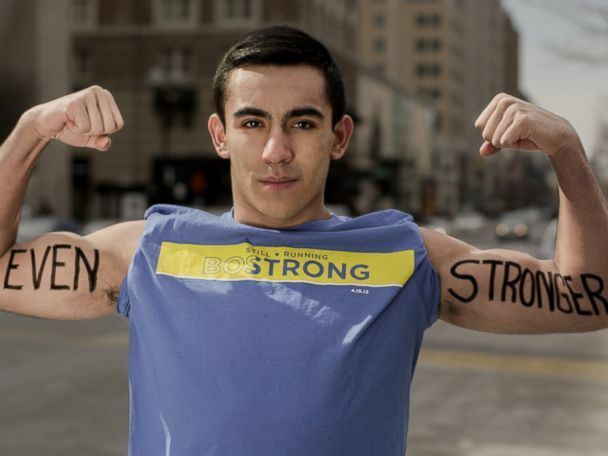 Dear World photographer Robert Fogarty takes portraits of marathon survivors.